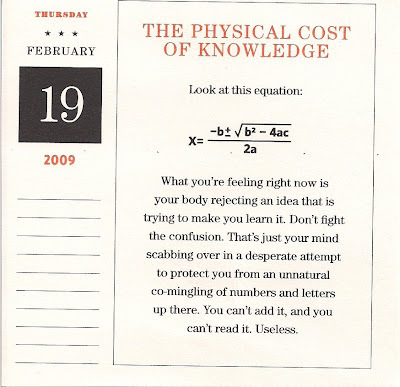 Finally, a way to put it into words- my complete and utter incompetance with math. You may have thought you were bad at math. But trust me- you are better at it than I. Seriously. It's astounding. Oh MAN! I hate math so badly, its horrible. I could never understand it and am glad I didnt waste time trying to understand...cause do I EVER use algebra or heaven-forbid, CALCULUS now? Ummm, nope. LOVE that philosophy! What is the point of that anyhow?I know some people get it and understand it-I survived it in college to get my degree but seriously, it's another language!